Looking for peace of mind on the road? Bruce Hyundai has your back! Thanks to Hyundai's high-quality unlimited mileage warranties, you can rest easy knowing that you and your vehicle are in good hands if anything goes wrong on the road. Plus, any and all Hyundai replacement parts you buy are covered for up to 1 year or 20,000 km, and all genuine Hyundai accessories are covered for 3 years or 60,000 km. 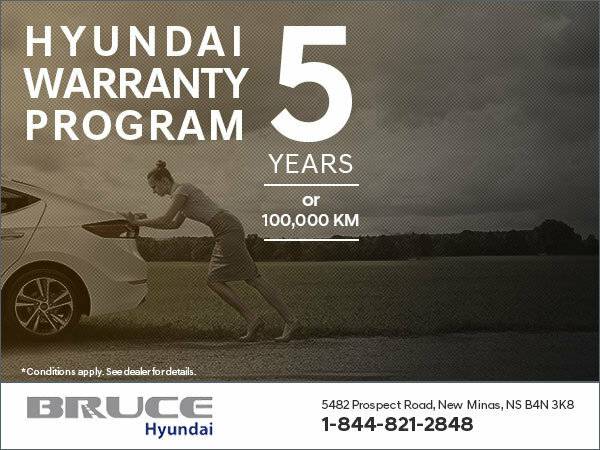 For the full lowdown on Hyundai Canada's Warranty Program, visit their website today, or contact us at Bruce Hyundai.